Donald Trump's swearing in would be remembered as perhaps the most extraordinary inaugural of a U.S. president. There were protests galore, not only in Washington DC where protestors and police clashed on January 20, but elsewhere too. The days preceding the inaugural were marked by unrest as was the day after when there were also demonstrations in other countries. Rarely has a U.S. president stirred as many people, in opposite ways, in so many countries as the 45th president has done. All this made President Trump's inaugural day not only unforgettable, but an emphatic reminder that his campaign trail promises would be coming true from day one. Much of what Trump said in his inaugural address had been heard, and criticized, before. 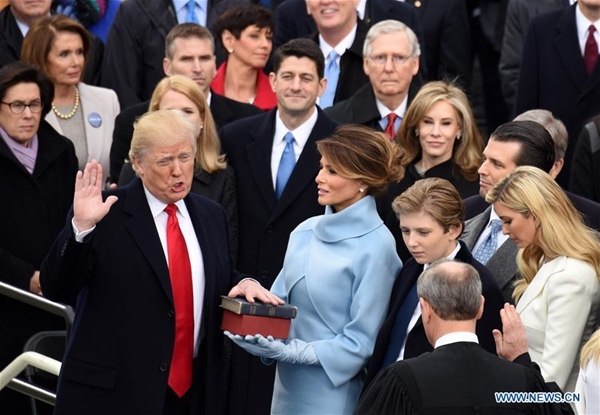 The fact that he returned to his campaign themes immediately after taking oath as president was resounding proof of Trump's determination to pursue a course that many hoped would be election rhetoric and not state policy. Thus, Trump has kept his promises to those who voted for him and disappointed his critics and opponents. This has sent political, economic and diplomatic shockwaves across the world. Trump proclaimed America's retreat from globalization to protectionism by declaring: "From this day forward, it's going to be only America first. We will follow two simple rules; buy American and hire American." He articulated his faith in protectionism as the panacea for prosperity and strength by saying: We will bring back our jobs. We will bring back our borders. We will bring back our wealth." Often "protectionism" and "protection" seemed synonymous and interchangeable in his speech. As, when he said: "Every decision on trade, on taxes, on immigration, on foreign affairs will be made to benefit American workers and American families. We must protect our borders from the ravages of other countries making our products, stealing our companies and destroying our jobs." The new president has dumped Obama's health care program and Climate Action Plan. He has intimated a U.S. exit from the Trans-Pacific Partnership and wants the North American Free Trade Agreement to be reworked. Trump has made his intentions clear beyond doubt, and he will have to be taken at his word on what he has sworn to do. Some of the more prominent and immediate consequences to follow will affect the U.S.' neighbors, especially Mexico; the two biggest developing economies, India and China; the U.S. establishment's bête noire - Russia; trans-Atlantic ally Europe, particularly Germany, France and Britain; and, trans-Pacific allies, Japan and South Korea. Mexico will be the first and worst hit - with a wall coming up to keep out immigrants, for which he has vowed to make Mexico pay for. The downturn in U.S.-Mexico ties will also impact the region. Trump is committed to a confrontation with China on the terms of trade. As a result, the U.S. would be lighting fires not only at China's door but around it as well. The emerging trade conflict, however, may spill beyond Sino-U.S. ties and intensify trade tensions around the world. The rise of new protectionist barriers would hurt both growth and globalization. Although right-wing Hindu groups aligned with India's ruling Bharatiya Janata Party of Prime Minister Narendra Modi hailed Trump and celebrated his win, the Indian economy may be in for a severe beating. The Indian rupee, which is already sliding against the U.S. dollar, may fall further as the dollar rises on investments flowing away from emerging markets - including India and China - and to the U.S. The weak rupee will not help exports because of Trump's "Buy American" policy. India's biggest export is information technology (IT) services. At least 75 percent of the IT industry's US$150 billion earnings are from exports, 60 percent of which are to the U.S. Indian IT companies may see a fall in outsourcing orders. There would be huge job losses, too, as Indians are the largest recipients of the H1-B visa, which has been made more expensive and restrictive. Indian pharmaceuticals, which were looking forward to better days after Obama, may also fare badly if the U.S. drug industry produces at home and cuts prices. Japan and South Korea fear being jettisoned militarily. That would add to their political and diplomatic woes and turn regional equations against their interests. Brexit Britain may benefit from Trump's anti-globalization shift; as will France where, like in the U.K., anti-immigrant, racist and insular forces have been boosted by Trump's victory. But, Germany with its liberal policies, such as welcoming refugees from the Middle East, may find itself isolated in Europe and pitted against Trump. This would deepen the cracks within the European Union and raise a question mark over the future of NATO. Russia, in contrast to the above countries, may look forward to better days. President Barack Obama has pushed U.S.-Russia relations to their lowest level. However, much as Trump may want to improve relations with the Kremlin, the U.S. security, military, defense and intelligence wings are bound to make the going hard. In the time of President Trump, the world is in for what the Chinese call "interesting times." The world awaits what rhetoric Trump will put into action, with implications for all major nations.